Great question. Can anybody give the answer and explanation? it is not mentioned in question. 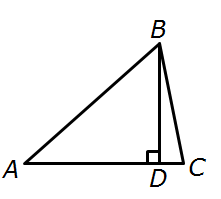 so it could be any triangle hence Choice D.
In this diagram, BD is much shorter than AB, so BD/AB is a small number that's pretty close to 0. So, in this instance, Quantity B is greater. So, in this instance, Quantity A is greater.